What do custom labels and the telephone game have in common? We all played the telephone game as kids or even as an icebreaker in a business setting. When a message is progressively whispered to other people, even in a small group, the last person rarely ends up with the same information as the first. And, if you don't understand the message to begin with, the meaning gets distorted even faster. But, how do custom labels come into play? Just as in the game, the phenomenon of simple miscommunication exists in the workplace. And when conversations cover topics that are more detailed and complex, communication becomes more challenging. Although a label looks simple, there are numerous components that go into it's design and manufacture that make it complicated, especially if you aren't a label expert. But when you are able to use a process and technology to guide your efforts, the probability of an accurate outcome increases. 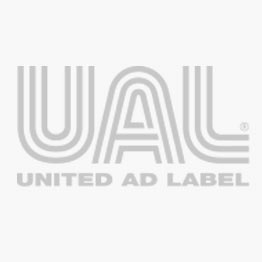 For example, United Ad Label developed a Custom Label Builder to take the complexity out of designing, pricing, proofing and ordering custom labels. The Custom Label Builder eliminates the telephone game. It walks you through each label building step only showing the options that are relevant to that step. As a result, when you make your selection, it automatically provides only the options that are applicable based on your previous input. Plus, when your design is complete, you can print out a proof to show others.This will ensure your vision meets their requirements. It's not foolproof but, it makes ordering custom labels simple and accurate. Plus, we've developed templates that make it even easier to design custom labels for common applications. How do you know the label sizes that fit your application and are the most cost effective? You don't have to! The generic label template only shows common sizes that both fit your needs and keep your costs in check. Plus, it's easy to compare prices for different sizes. 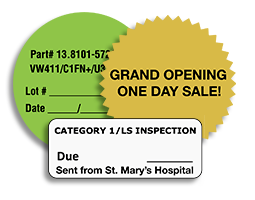 The generic label template is perfect for reminders, attention getters, address labels, quality control, inspection control and even veterinary prescription labels. 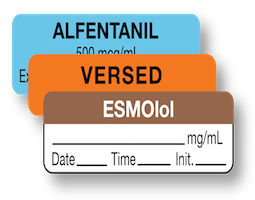 When you require a color that's different from the the ASTM standard or need to call out a unique drug, the Anesthesia Label templates are the option for you. The UAL custom label builder technology recognizes that these labels are required to wrap on curved surfaces without flagging. As a result, the adhesive, material and finish are automatically selected to ensure your custom label is manufactured properly and performs as required. Whether it's a Joint Commision requirement, an industry regulation or just information that increases the comfort of consumers, service and inspection labels are required on all kinds of equipment. 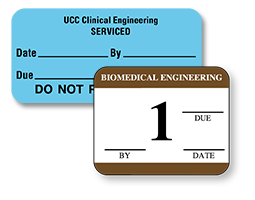 The Service and Inspection Label template makes it simple to add fields for due date, completed date, company name, department name, phone number and extension. 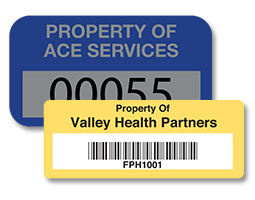 Asset tag labels are a simple way to track expensive and irreplaceable equipment. Customize your company name, add a unique barcode or tracking number to control and maintain your equipment. The United Ad Label custom label builder makes it easy to design, price, proof and order a custom label online. But, it might makes the telephone game something you only play at your kids parties! Watch the United Ad Label Custom Label Builder video to see how it works for your application or give it a try today!